Unfortunately the "Protect Yourself Against Identity Theft (Free 30-Day Trial)" offer is no longer available. In today's world there are innumerable ways a thief can get your information and use it to their benefit -- and your detriment. It is really not a matter of if you will be at risk, but when. If you are not actively protecting yourself against having your information stolen, you are literally gambling with your personal and family's good name, credit and identity. Is it really worth it? You can best protect yourself by actively monitoring all of your information, from credit cards and social security number, to even your address and phone number. 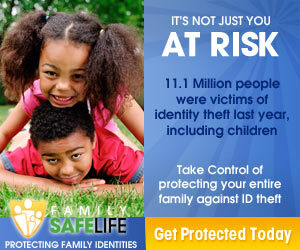 Sign up for a free 30-day trial of Family Safe Life today and start your protection now!